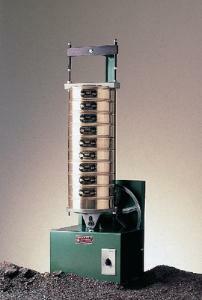 Our electric sieve shaker is specially designed for both vertical and horizontal tapping action. Spring-loaded tie rods and a 30-minute, built-in timer offer a steady, regulated shaking action. This unit has a larger capacity than most models, accommodating up to nine standard 8" sieves, not included, as well as a bottom pan and lid. A built-in adapter and convenient lid lock allow the unit to hold fewer sieves, or to hold smaller 3" or 6" diameter sieves. It is powered by a quiet-running, beltdriven, 1/4 hp motor. 115 VAC, with a 5 1/2' cord; 60 Hz. Size 14"L x 12"W x 36"H; weight: 65 lbs.